A professionally designed and built Mastering room housing only the finest choice of Analogue and Digital equipment. Every aspect of this room is geared towards highest quality Mastering. Each piece of analogue hardware used in our studio has been rigorously tested up against most other options. Each piece of equiptment has been choosen for sound quality and usability over anything else. Each box had to offer something really special to stay at Precise. 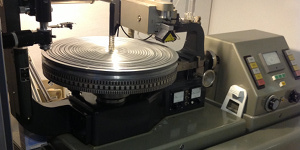 We are proud owners of a Neumann VMS66 professional cutting system. We have the latest version of the Neumann amp rack and cutterhead which gives us the equal tools to make the best cuts available. We have completly rebuilt the electronics at every stage to make this system perform as it did when it left Neuamnn HQ. We only use the highest quality digital hardware and software algorithms which have been rigorously tested to ensure they are the correct choice for our work. Digital is an ever changing evolution which is why we ensure that we are keeping up with the latest trends and standards. A Neutral monitoring environment where the music can been heard in its clearest and truest form is key. Our room was designed by the highly accredited Leif Mases. A fine measure of diffusion and absorption have been designed and installed to create a comfortable neutral listening environment. SPL PQ is a fully parametric, dual-channel 5-band Mastering equalizer. As a member of the 120V Mastering Series, the PQ is based upon SPL's unique 120V SUPRA op-amps with 150 dB dynamic range. Only the finest components are used throughout to offer the ultimate sound and built quality. Maselec MEA-2 is a stereo or 2-channel, four-band precision analogue equalizer with stepped Q/shelf, frequency and cut/boost controls on each band. It is designed for mastering applications where ultimate sonic performance, musicality and precision are required. EAR Yoshino 825Q All the equalising circuitry in the EAR825 are completely passive, with valve (tube) electronic stages providing buffering and amplification on the input and output. This valve circuitry follows designer Tim de Paravicini’s philosophy of low distortion, low noise, high headroom and wide bandwidth. Maselec MLA-3 three band compressor with comprehensive controls for a very wide range of sounds. Adjustable crossover frequencies and exceptionally accurate summing of the three bands. Maselec MPL-2 a brick-wall and high frequency limiter. It can be used to achieve high subjective levels and reduce unwanted high frequency levels (de-essing). The MPL-2 is also used to ‘smooth’ and give digital recordings a more ‘analogue’ character. Neumann VMS66 this very rare hand built lathe was purchased new in 1966 by Masterdisc NYC where it lived for over 30 years. We imported and fully restored this beauty ourselves, which was a challenge to say the least but the rewards and final outcome is just simply fantastic. Neuamnn SAL 74B Amp Rack Solid build quality, reliability, precise adjustment and control, coupled with heaps of clean power and headroom this amp rack drives the signal onto the lacquers with ease. As with the Lathe we have fully restored all components and made a few mods while we were there. Neumann SX74 Cutterhead transparent and wide open stereo cutterhead. Can take plenty of level clean whilst retaining dynamics and full spectrum frequency response. We love these cutterhead's. Zuma Audio Pitch Computer Jon Bitner is the genius behind this 1980 digital computer. It samples the music 16 times per revolution allowing the lathe to nestle the modulating grooves accurately maximising the precious space on the lacquer for tightly and precise packed sides. PMC IB2 are three way, high resolution reference monitors. Their signature is phenomenal dynamics, resolution and transparency, all of which derives from a front vented ATL™ (Advanced Transmission Line) design. Bryston 4B SST is a dual channel amplifier which is acclaimed internationally as being suited for the finest and most sophisticated sound systems. Bryston BP26 preamplifier offers a significant step forward in capturing the subtleties, nuances, and emotions of recorded music. All aspects of the signal flow are enhanced with lower noise and distortion figures, and higher load levels, offering a rich, vibrant & transparent audio experience. Genex GXA8 / GXD8 Converters In the case of both the GXA8 and GXD8, audio excellence lies at the heart of the design philosophy. DSP-free circuitry eliminates potential distortion from asynchronous address and data buses, while the analog stages exhibit ultra-low noise and distortion figures. Korg MR2000S is a 1bit DSD (Direct Stream Digital) recorder capable of recording at 5.6Mhz.